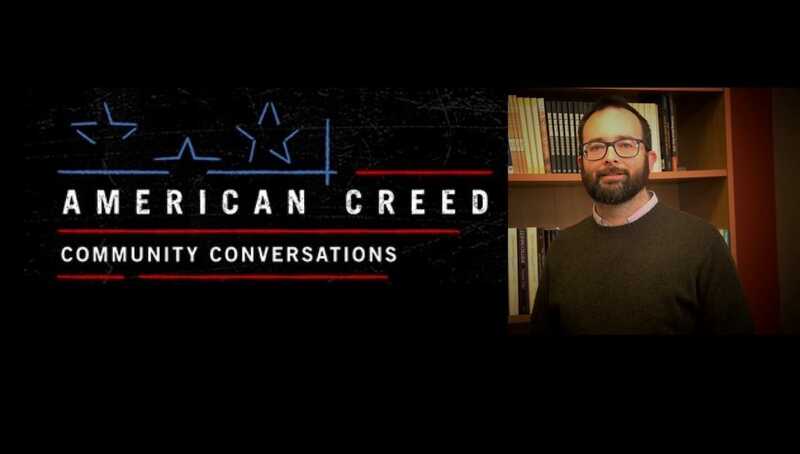 University of Scranton History Professor Adam Pratt, Ph.D., will lead a discussion following the screening of the documentary film “American Creed” as part of The Albright Memorial Library’s programming intended to encourage civic engagement. The program, set for Mar. 28, is the first in a series of programs supported through an award from American Library Association and the University’s Humanities Initiative. The Albright Memorial Library, in collaboration with The University of Scranton, will host a series of events that encourage civic engagement among area residents. The programs are related to the PBS film documentary “American Creed,” and are funded through an award from American Library Association. The first event will be a screening of the documentary film “American Creed,” followed by a Community Conversation with discussion and question and answer session led by Adam Pratt, Ph.D., assistant professor of history at The University of Scranton, and in collaboration with the University’s Humanities Initiative. The screening will be held on Thursday, Mar. 28, at 6:30 p.m. in the Albright Memorial Library’s Henkelman Room. The snow date is Monday, April 8, at 6:30 p.m. In the documentary film, former U.S. Secretary of State Condoleezza Rice and Pulitzer Prize-winning historian David M. Kennedy come together from different points of view to investigate the idea of a unifying American creed. Their spirited inquiry frames the stories of citizen-activists striving to realize their own visions of America’s promise across deepening divides. At the heart of this film, Rice and Kennedy lead a moving discussion with first-generation college students about the question: what does it mean to be American today? American Creed Community Conversations are film screenings and scholar-facilitated discussions that mirror the type of conversation Rice and Kennedy have in the film and are designed to engage Americans in reflection and dialogue about their own part in the American story and in acting to shape that story for the better. The second event will be a Political Dialogue on Monday, April 15, at 6:30 p.m., also in the Albright Library’s Henkelman Room. This event is hosted in partnership with The University of Scranton through their Political Dialogues Initiative. Community members from varied political perspectives and backgrounds will break up into groups with University facilitators to share the experiences, values, hopes, and concerns that shape how they feel about our country, while also seeking to understand those who think differently. Short clips from the American Creed documentary will introduce the dialogue. In addition, the Albright Library will host a third event in the summer during the Library’s Social Justice Book Club meeting on Monday, July 8, at 6:30 p.m. at the Albright Library. The book club will read and discuss “Citizen: An American Lyric” by Claudia Rankine. The book discussion will also include short clips from the documentary as they pertain to the themes of the book. Registration is free and required for all events. To register online, visit albright.org or call Jessica Serrenti at the Albright Memorial Library at 570-348-3000 ext. 3023. The events are made possible through a partnership with the University and the American Library Association’s American Creed: Community Conversations grant program, in partnership with Citizen Film, WTTW Chicago, Corporation of Public Broadcasting, the National Endowment of the Humanities and the National Writing Project.